For June 2018 data on these questions, click here. The American public has clear-cut opinions on both issues at the center of the current debate on immigration policy. A large majority (74%) favors granting permanent legal status to immigrants brought to the U.S. illegally when they were children, but 60% oppose a proposal to “substantially expand the wall along the U.S. border with Mexico” – a longtime goal of President Donald Trump. When the two policies are taken together, 54% of Americans both favor granting permanent legal status to immigrants who came to the U.S. illegally as children and oppose greatly expanding the wall along the U.S.-Mexico border, according to a new Pew Research Center survey conducted Jan. 10-15. There are substantial partisan differences in opinions about both policies: About nine-in-ten (92%) Democrats and Democratic-leaning independents say immigrants brought to the U.S. illegally as children should be granted permanent legal status. Republicans and Republican leaners favor this approach as well, though by a much more modest margin: 50% support this, while 40% are opposed. This question addresses all unauthorized immigrants who meet this description and does not specifically mention those enrolled in the Deferred Action for Childhood Arrivals program (DACA), whose fate has emerged as a key issue in last-minute congressional negotiations aimed at avoiding a government shutdown. Opinions about expanding the U.S.-Mexico border wall are even more starkly divided along partisan lines. By three-to-one (72% to 24%), Republicans favor expanding the border wall. Democrats oppose this proposal by an even wider margin (85% vs. 13% in favor). The combined responses to both measures reveal Republican divisions on these issues: 34% of Republicans both oppose permanent legal status for immigrants brought to this country illegally as children and favor an expanded border wall. However, nearly as many Republicans (30%) favor both policies, while another 17% favor legal status for those brought to the U.S. illegally as children and oppose an expanded U.S.-Mexico border wall. By comparison, Democrats are united in their views: 80% support permanent legal status for those brought illegally to the U.S. as children and oppose expanding the border wall. 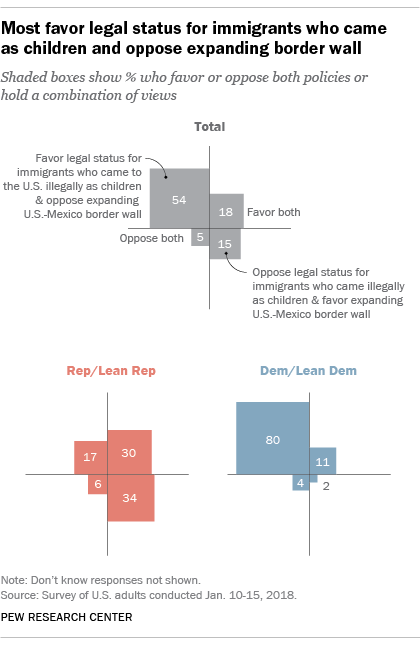 Among Republicans and Republican leaners, there are significant ideological and demographic divides in views of both of these immigration policies. By 57% to 34%, Republicans younger than 50 support a policy to grant permanent legal status to immigrants who came to the U.S. illegally when they were children. By contrast, Republicans ages 50 and older are evenly divided (45% favor, 45% oppose). There is a similar divide by ideology: Most moderate and liberal Republicans (58%) support this immigration proposal, while conservative Republicans are split (46% favor, 44% oppose). Republican women are somewhat more likely than men to back this proposal, and Republicans who are college graduates express more support than those who have not graduated from college. While majorities of nearly all Republican groups back substantially expanding the wall along the U.S. border with Mexico, those ages 18 to 49 are less likely to support this policy than those 50 and older (60% compared with 83%). And support for an expended border wall is significantly higher among conservative Republicans (81%) than among moderates and liberals (55%). Majorities across all demographic, religious and educational groups favor granting permanent legal status to immigrants who came to the U.S. illegally as children. Opinions about expanding the U.S.-Mexico border wall vary more widely across groups. For instance, 45% of whites favor expanding the wall, about twice the shares of blacks (22%) and Hispanics (20%). And while a wide majority of adults under 50 (70%) are opposed to expanding the wall, those 50 and older are divided in their views: 48% say they oppose the expanded wall, 49% are in favor. There also are significant differences in opinion by religious affiliation. White evangelical Protestants are more likely to favor than oppose an expanded wall by about two-to-one (65% vs. 32%). By contrast, white mainline Protestants are largely divided (49% favor, 47% oppose); three-quarters of black Protestants are opposed. Among Catholics, there are similarly wide differences by race. A 55% majority of white non-Hispanic Catholics favor the proposal, while fully 83% of Hispanic Catholics are opposed to an expanded border wall. Across education levels overall, more oppose than favor the proposal to substantially expand the U.S.-Mexico border wall. Still, those with a college degree or more education (70%) are more likely to oppose this proposal those without a college degree (56%). Among whites, educational differences are even more pronounced. About seven-in-ten (72%) of those with a postgraduate degree, and 63% of those with a college degree, are opposed to an expanded wall. By contrast, a 57% majority of those with a high school diploma or less education favor expanding the wall. Note: Full topline results and methodology can be found here.